In a former life, when I taught German, one of my greatest challenges was convincing students that German was a language worth learning and far better than the other language options offered at the school (we were all competing for students). I can humbly admit that though I taught a language Mark Twain claimed was the reason that God invented eternity – to give some of us a chance to learn German, I was always rather successful in my quest for students because I was willing to go to great lengths to acquire students and perhaps not always play fair. I explained to potential students that during German class, they would learn about the culture of German-speaking countries. We would listen to Falco and Mozart, celebrate Oktoberfest and Krampus and we would bake real Viennese Apfelstrudel. 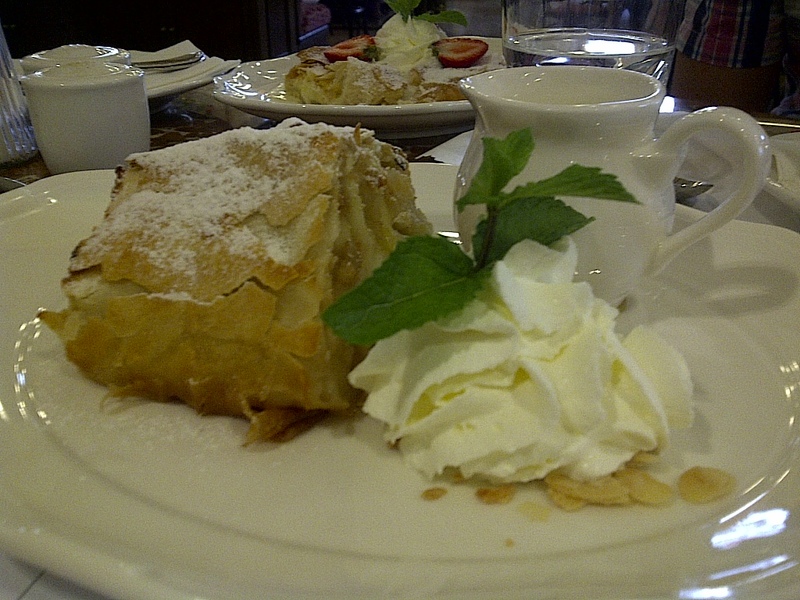 And the Apfelstrudel got ’em everytime. 1) Apples: First peel and slice the apples (the apples should probably be cut in 1/8 inch slices (quarter the apple and slice these lengthwise as well) (dispose of the core and peels) – you will probably need about 10 apples for two strudels. 2) Mix for Apples: Next you mix a little cinnamon (depends on how much you like the taste) as well as some sugar and brown sugar (I don’t add all that much – somewhere from 1/4 cup to 1/2 cup). Also add some lemon juice to the apples at this time. You could also add a drop of vanilla if you like. Next melt about a half of stick of butter in a pan and add about 1/2 can of bread crumbs. Stir the bread crumbs until brown. Add these to the apple mixture. 3) Prepare Filo Dough: Wet and wring out one towel and spread out flat on counter. Layer the dry towel on top of this. Next place about two sheets of Fillo dough on the towel. Brush melted butter on sheet. Place two more sheets on top of these and butter them as well. 4) Add filing and place on pan: Lengthwise down the middle 1/3 of the strudel, spread apple filling. Fold the outer 1/3 sides over the center to give yourself an apple strudel form. Roll up edges. Brush butter over the outside. Slide your arm under both towels to balance the strudel on your arm and flip the strudel onto a baking pan covered with wax paper. Brush butter on the upper side as well (what was previously the bottom). Bake the apple strudel at 400F for about 13 – 15 minutes until golden brown (the stove may smoke during baking). Halfway through the baking you may want to brush on some milk for a more golden color. When golden – remove, sprinkle with powdered sugar and enjoy. This is wonderful if served with some German vanilla pudding poured over the top (you can buy this at the World Market and it is not as sweet as US pudding – the pudding should not be cool and even a bit liquidy). Also good is served with fresh whipped cream. Guten Appetit und viel Vergnügen!